The end of September 2017 saw electronic music icon Excision launch his first music festival, Lost Lands. Over 3 days, Lost Lands brought the historic Legend Valley in Ohio to life with PK Sound’s Trinity – the world’s first and only advanced robotic line array. Lost Lands did not disappoint, delivering one of the best musical experiences of 2017 which PK Sound was thrilled to be a part of. Excision (Jeff Abel) has been dropping beats since 2004 and has been an honorary member of the PK Sound family for over a decade. Hailing from British Columbia, Canada, Excision is a major player in cultivating bass music globally, with his passion for production driving him to inject his trademark sound into the rapidly growing electronic music scene. Well known for the high level of production quality that he brings to his live shows, Excision and the Lost Lands festival saw no exception to this precedent. 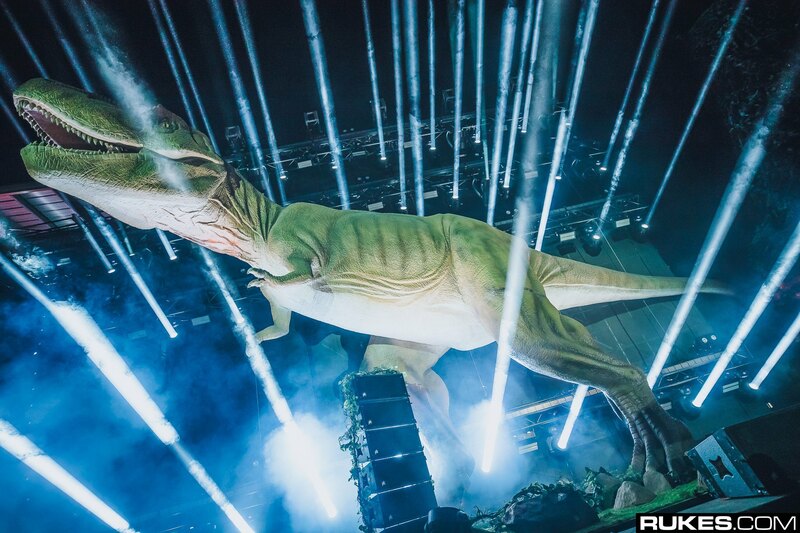 The Lost Lands team treated festival goers to an immersive, larger-than-life sensory overload with mind warping visuals, clean, powerful bass, and of course, a family of life-sized dinosaurs around the grounds to help everyone embrace their wild side. But the event wasn’t always intended to be the massive monster it became. 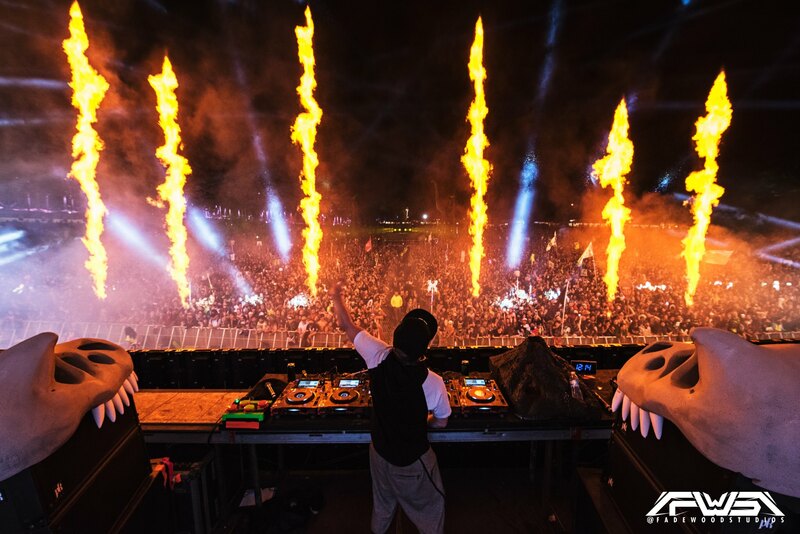 “The scale of Lost Lands started out a lot smaller, we were initially hoping for 10,000 people, but when we went on sale and sold nearly 20,000 tickets in the first 48 hours we realized that not only was demand far greater than we thought – so were the expectations,” says Excision. This required an equally massive sound experience which was provided across two stages by PK Sound. Stage one, also known as the “Prehistoric Paradox” stage, deployed the powerful Trinity line array the main hangs consisted of16 modules per side, as well as an individual hang of 12 modules to fill the VIP section. Additionally, the PK team deployed 12 ground-stacked VX-10 line array modules for on-stage out-fill (6 per side), 8 VX-12 line array modules for front fill with field delays consisting of 16 additional Trinity modules, 8 per side. The only way to compete with that much line-array is to also bring an equal amount of low-end, which Pk Sound most certainly did. The 78 CX-800 subwoofers stayed true to form and kept the festival goers head-banging all week long. Only partial cardioid deployment was necessary to control the sound field off axis at the Lost Lands festival grounds at Legend Valley. On stage monitors consisted of 4 VX-10 line array modules (2 per side), 2 CX-800 high powered subwoofers (1 per side) and 6 SW-215 stage wedges. Not to be outdone by the Prehistoric Paradox stage, the Cave of Souls stage was located beneath a massive festival tent structure which housed two main hangs consisting of 24 Trinity line array modules (12 per side). Main front fills consisted of 4 VX-12 line array line array modules which was all balanced with a smaller, albeit equally rocking configuration of 42 CX-800 high powered subwoofers. The stage monitor set-up consisted of 4 VX-12 (2 per side) with an addition of 2 CX-800 (1 per side) for the low-end. In order to provide an accurate sound experience for the performers, 6 Klarity-12 speakers were utilized as stage wedges for the downstage mix. 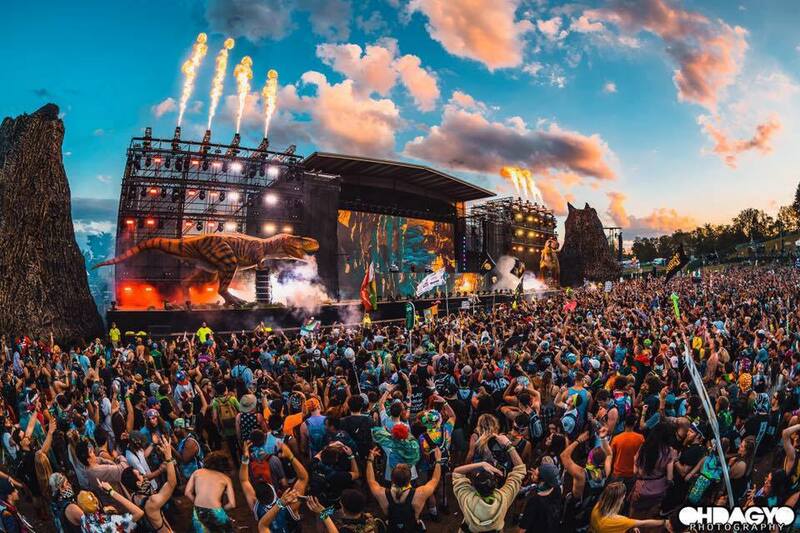 With a huge line-up of international EDM heavyweights, how could Lost Lands not become the mother of all bass festivals? Joining Excision’s prehistoric party were Zeds Dead, 12th Planet, Cookie Monsta, Destroid, Ephwurd, Funtcase, Ghastly, Herobust, Illenium, Kill The Noise, Liquid Stranger, Rezz, Slander, and Snails. However, it was the legendary B2B set by Excision himself and Datsik that really stole the show. Helping to unleash an epic festival experience to the fans was Excision’s multi-million-dollar sound and light stage design, Paradox, which includes the Trinity robotic line array system which is able to sculpt the sound field in 3 dimensions from front of house. This 3rd surprise pop up stage only served to further cement Lost Lands into music festival legend. For a festival of the size of Lost Lands, Trinity was the system of choice, equipping the team with the tools they needed to dial the sound in with a high degree of accuracy. The result was clean, powerful bass, with crisp, full mids and highs, as well as focused sound throughout the whole area. One of the main challenges faced by Excision and the festival audio techs was ensuring they were able to abide by strict sound levels outside of the venue, while not sacrificing the quality and depth of the sound coming from the stages. The whole PK Sound team were incredibly proud to witness Excision’s first successful foray into the festival world. It’s great to see the Trinity system at the helm of such a powerhouse event, being pushed to new levels and consistently excelling in delivering the highest quality of sound. PK Sound’s Trinity system and Paradox delivered the force and fervour Excision needed to bring his creative vision for Lost Lands to life. We can’t wait to team up again for Lost Lands 2018! How can PK Sound help with your next big event? Get in touch today to find out more about our systems and services. Keep up-to-date with all the latest news and events powered by PK on our Facebook page and Instagram.